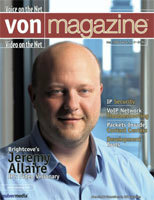 VON Magazine Cover Story: "Brightcove's Jeremy Allaire - IP's Video Visionary"
The current edition of VON Magazine features an interview by Jeff Pulver with Brightcove's Jeremy Allaire. The article covers a wide range of topics including the Jeremy's background in the industry, perspectives on media distribution and the explosive growth in Internet TV. From the interview: "Allaire: Brightcove operates an Internet TV service. We help producers, media owners and programmers build Internet TV businesses by providing them with a service to distribute and monetize their video and rich media. If you have rights to video and brand assets, you can launch a broadband channel in a day with us. We help you publish, deliver, sell, put advertising in and syndicate your content. Our mission is to help drive distribution and create compelling experiences for consumer." Read more of the interview in the the current edition of VON Magazine.